Travel and fitness don’t always feel like the perfect pair. At Cheeca Lodge & Spa, the two go hand-in-hand. And with the holidays coming up, we know how important it is to exercise and stay in shape without sacrificing any relaxing vacation time. Cheeca offers a variety of guided on-site classes, making it easy to stay fit (and have fun) while you’re away from home for the holidays. For a challenging and unique yoga experience, take to the water on a stand-up paddleboard (SUP). Every Friday evening and Sunday morning, we offer hour-long SUP yoga classes that welcome both beginners and seasoned yogis alike. It’s a great opportunity to practice yoga poses while enjoying the relaxing sound and motion of the ocean. Our resort also features several adult tennis clinics throughout the week. Our half-hour beginner’s clinics are complimentary for guests on Tuesday mornings, while our more advanced clinics on Tuesday, Thursday, and Saturday mornings are $25 per attendee. Feeling competitive? Join our tennis round robin on Tuesday and Saturday mornings at 10 a.m.
Offering a classic workout experience, our Total Body Toning classes are held every day except Friday and are a great way to break a sweat. Head to our Fitness Studio and jumpstart your day with an invigorating session from 9-10 a.m., led by a certified instructor. Our facility also features the latest equipment from Life Fitness. If you’re in the mood for something more adventurous, attend one of our hour-long resort SCUBA courses, held every Friday and Saturday morning. This class is highly recommended: The Florida Keys are home to the continental United States’ only living-coral barrier reef, and it’s certainly worth exploring. We know the holidays can be hectic, and even stressful, which is why the Cheeca Spa is the perfect place to unwind and reset. Featuring luxurious amenities and services such as a heated pool with butler service, state of the art fitness center, and 7 spa treatment rooms, our spa is fully equipped to cater to your every need. Check our calendar of events for the most up-to-date activities at our Islamorada resort. The Florida Keys are some of the most gorgeous islands in the continental United States. With stunning reefs, historic revolutionary outposts, and luscious beaches and landscapes, there’s no shortage of Insta-worthy places to snap your vacation pictures. Check out our favorite spots to kick your Instagram game up a notch. Nestled in the heart of Old town Key West is the home of lauded American author Ernest Hemingway. Refurbished as a museum (open daily), the Southern Gothic home is most famous as a dwelling space for more than 40 local cats. Right off Key West, Dry Tortugas National Park sits in the open water. Accessible only by boat or seaplane, Dry Tortuga is home to Fort Jefferson, the coastal military center built in 1825, from which you can take breathtaking pictures of the surrounding turquoise water. Not many can say they’ve been to the very end of a country. Hundreds of tourists flock to the Southernmost Point to take a picture with the iconic buoy, indicating that you’re at the end of the line – just 90 miles from Cuba. And of course, our own backyard has some pretty beautiful vistas, too. Anne’s Beach, just a short walk from Cheeca Lodge, boasts pristine white sands and crystal-clear water. The quaint town of Islamorada is full of hidden gems worth checking out. Here are our top picks for fun activities, where to find trinkets, and the best places to explore. The hottest restaurant in town…for fish! 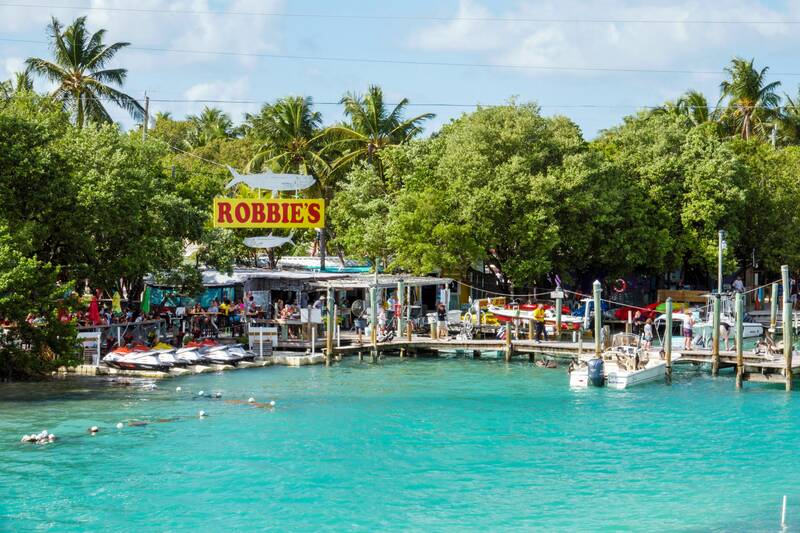 The Tarpon, a medium-sized fish native to the Atlantic, usually stops at Robbie’s Marina for breakfast, lunch, and dinner. Hordes of these fish linger near the marina for hours, knowing that tourists and locals alike are sure to feed them. A spectacle to behold, and well worth the $4 for a bucket of feeding fish, head here throughout the day for instant entertainment and fun. The Florida Keys are dotted with little green islands, separated from the mainland by translucent turquoise water. Most of the islands are reachable by boat, but the real adventurers hop in a kayak and paddle out to Indian Key, a historical site that’s part of the Florida State Park system. The shallow water between Islamorada and Indian Key is perfect for kayaking in an area where the island’s many hidden historical secrets and treasures allow you to explore the day away. Nestled on the small island of Islamorada is a vibrant and growing arts and culture scene. The Morada district is known for its galleries, studio spaces, boutiques, and creative restaurants, making it one of the most exciting neighborhoods in the Florida Keys. The art galleries combine lush island themes and the presence of the surrounding and engulfing Atlantic Ocean, giving way to some truly unique pieces that are adept at communicating stories of the American islands diaspora. First and foremost: Congratulations on your engagement! If you’ve decided on a beach wedding, we like the way you think. Offering beautiful weather and ocean backdrops, our vibrant island community is the ideal choice for a destination wedding. And at Cheeca Lodge & Spa, we are proud to be the full-service venue of choice for elegant ceremonies and receptions in Islamorada, FL. Wondering where to begin? Below we’ve shared four tips to help you start planning your Florida Keys wedding. It’s important to keep in mind that a destination wedding requires some advanced planning for both you and your guests. For example, save-the-dates should be in the mail a bit earlier than a local wedding (think: 10 to 12 months ahead of time) to make it possible for your nearest and dearest to schedule PTO, book transportation, and make other travel arrangements. We recommend visiting Cheeca before your big day—consider it a “venue vacation.” Take time to sit down with our dedicated on-site coordinators and discuss your vision, and set up meetings with our some of our preferred Florida Keys wedding vendors. We’re happy to refer the best local entertainers, hair stylists and makeup artists, photographers and videographers, and more. Enlist the help of a full-service wedding planner or day-of coordinator for added peace of mind. The expert planners and coordinators at Cheeca offer diverse, personalized services that ensure a seamless experience for you and your guests. These services may include securing outside vendors, providing event timelines, overseeing design and the placement of decor, and more. Remember why you chose an island wedding in the first place, and make sure to schedule time to soak up the relaxing Florida Keys atmosphere and our on-site amenities. In addition to stunning event spaces, Cheeca offers luxurious accommodations, world-class dining, nearby adventures and activities, and a 5,700-square-foot spa. Learn more about Florida Keys weddings at Cheeca Lodge & Spa, and submit a request for proposal today. ‘Tis the season for tropical drinks. Granted, we’re blessed with beautiful Florida Keys weather year round, so it’s almost always a good time for a cool and refreshing beverage. However, we believe that the island’s warmest months bring on even stronger cravings for cocktails from our favorite tiki bar in Islamorada: The Tiki Bar at Cheeca Lodge & Spa. Whether you prefer sweet or spicy, on-the-rocks or frozen, you can enjoy some of the best summertime drinks from our welcoming open-air bar. Satisfy your sweet tooth with our Blueberry Mojito (Stoli Blueberry, Fresh Mint, Fresh Lime Juice, Simple Syrup, Fresh Blueberries), a traditional Cuban highball with a fruity twist. The Island Old Fashioned (Zaya Gran Reserva 12 Year Rum, Cardamom Bitters, Turbinado Syrup, Club Soda, Orange Garnish, Luxardo Cherries) is our island-inspired update to Don Draper’s drink of choice. If you like to keep things spicy, try the Hot Chili (Stoli Razberi, Triple Sec, Cranberry, Fresh Squeezed Lime Juice, Simple Syrup, Fresh Serrano Chili). As its name suggests, this cocktail gets its bite from the fresh serrano chilis. In the mood for a classic frozen drink? You can’t go wrong with our perennially popular Pina Colada (Rum With Coconut, Pineapple, Dark Rum Drizzle)—poured into a cold glass and served with ocean views. Finally, the frosty Mudslide (Vodka, Kahlua, Baileys, Crème De Cacao) is like liquid dessert. With a vodka kick. For those seeking alcohol-free alternatives, we also serve crowd-pleasing Mocktails, including the No-jito (Fresh Lime, Mint And Soda) and the Un-bellini (Peach Puree And Club Soda). Or you can take your pick from our satisfying selection of fresh blended juices and smoothies. Enjoy the Tiki Bar and other on-site restaurants in Islamorada when you stay at Cheeca Lodge & Spa in the Florida Keys. Summer often means increased exposure to sun, sand, and surf, a combination that calls for a rejuvenating treatment (or two) from The Spa at Cheeca Lodge. Our lush 27-acre oasis features a heated lap pool, cabanas with butler service, and other premium amenities. It’s the perfect place to slip away to for a little self-care, especially when the rest of the family is off enjoying our many on-site activities. Treat yourself to the ultimate island indulgence with the top five treatments for summer at our Islamorada spa. The Summer Breeze massage is inspired by classic, stress-relieving Swedish techniques and uses light rhythmic pressure. This blissful service is enhanced with relaxation stretching. With endless summer activities, your feet may be in need of a little extra love. Opt for our Barefoot Elegance Massage, which not only soothes tired feet, but promotes healing and relieves stress in other parts of the body. The perfect companion to a day at the beach, this refreshing treatment embodies the essence of the ocean with a full-body, salts of the earth scrub, followed by a soothing white algae body mask. The accompanying natural seaweed gel adds an ample dose of moisture. This seasonal facial is packed with vitamins and, like the Ocean Cocoon Body Treatment, it includes the added benefit of seaweed-based products that hydrate, replenish, and repair skin. This quickie facial is the perfect choice for those with a busy summer schedule. It’s light yet effective, and designed for all skin types. Plus, it only takes 25 minutes. In addition to our luxurious treatments, we recommend taking advantage of our unique selection of spa refreshments. Make your service even more special with a bottle of bubbly or a sparkling wine split, and satisfy cravings with a cheese course or tropical fruit plate. And be sure not to skip our extra sweet local favorite: the key lime tart. Learn more about our Florida Keys spa and submit a request for summer spa services today.